We offer electrical components for dollhouses, room boxes and dioramas; provide specialty LED lighting and replacement bulbs; Custom in-home wiring and personalized assistance for wiring your dollhouse. In addition we have created a number of specialty items for the dollhouse: Working ceiling fans with lights; flickering LED log ‘n flames; florescent shop light; landscape lighting and theater spotlights, and more. 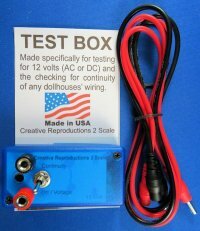 Creative Reproductions 2 Scale is the only place you will find remote controls specifically wired for turning on/off different lights within your dollhouse. 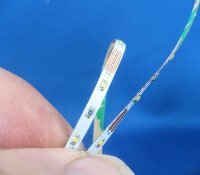 We have created the only 1/8” wide ribbon of LEDs which is perfect for indirect lighting of railway train displays, room boxes, individual rooms of a dollhouse or for illuminating the inside of kitchen cabinets in your dollhouse. If you have been looking for a way to replace those extremely hot incandescent screw-base bulbs, we have screw-base LED replacement bulbs for either the flame-tip or pea bulb size miniature light bulbs. This is not a new way to wire. It is, however, a safer, more efficient procedure that will enhance the look of your dollhouse. Adding electricity or the lighting of a dollhouse adds a whole new dimension to your project. It enhances all the details of your work and allows everyone to see what is actually inside each and every room. Wiring your project should be fun and not something to fear. We have developed a system with components that improve and simplify the wiring using the latest technology. Please take the time to look over what we have to offer and feel free to ask for assistance or help with the wiring of your dollhouse.